Additionally, themajority of the anticipated resources we will receive from the 1.5% income tax will be dedicated to funding public safety equipment needs that have been neglected over the course of the past 10 years. As an example, there is a dire need for fire engines and other apparatus, gas masks, coats and boots for firefighters and squad cars. The correspondence began when the Mayor called on the Governor to provide Indiana State Police support for Gary. The Governor responded on July 11, 2013 asking for a detailed plan as to how the City would use money from the newly implemented County Option Income Tax to help fight crime. through the hiring of more officers and further implementation of Community Policing programs. In the short term, we are looking to augment the number of police on the street through our monthly saturation patrols in cooperation with neighboring departments and the assistance of Indiana State Police. .25% of the 1.5% County Option Income Tax (COIT) is reserved for Public Safety and is to be divided among the county and municipalities. The FOP and many police officers supported the COIT. It should be noted that the Governor asked about that portion of the income tax revenue but Mayor Freeman-Wilson appears to be addressing the entire funding to be received under the COIT. Kara Michalic spoke to the Northwest Indiana Gazette tonight. As an animal rescuer, she is appalled that the Crown Point police shot two beautiful animals. The dogs, 3 1/2 year old sisters named Atka and Kenai, were family pets who had never shown aggression. Kara explains that they were with a family down the street from the incident just minutes before. That family gave them water and in exchange received affection and kisses from the pets. The Gazette has verified this via email and hopes to speak with that family tomorrow. 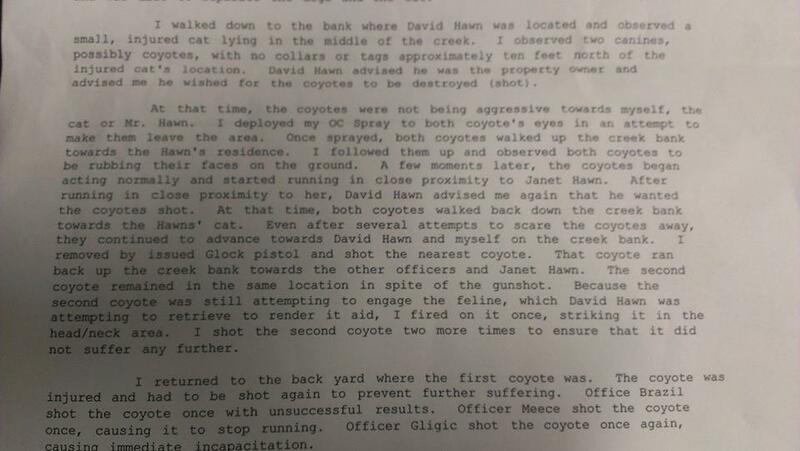 A review of the police report indicates that David Hawn, the property owner, demanded repeatedly that the officers “kill the coyotes.” The police report also indicates that the dogs were not acting aggressively. After the shooting, Mr. Hawn apparently called the Veterinarian who received the murdered animals to state that he wanted the animal pelts. Kara explains that her stepfather was trimming trees when the dogs escaped from the gate. Google Maps shows the area as a residential area, bounded on one side by the Erie-Lackawana Trail and a nearby baseball diamond. Lots are in the 1/4 acre size range. Given the proximity of the bike trail, the baseball park and a golf course, it is arguable that the discharge of weapons is criminal. Questions remain as to the nature of the threat to human life and less lethal forces which could have been used. Did the officers have tasers? The Gazette would like to hear from you. Do you believe the officers were justified in discharging their weapons in this instance? UPDATE: There will be a vigil at 8:30 tonight at the Crown Point Square. All are invited to attend. Virginia Governor to resign as part of plea deal? Unconfirmed sources say Virginia Governor Bob McDonnell, a republican, will resign. McDonnell has come under fire for failing to report a gift of a Rolex watch valued at $6,000. State law requires the reporting of any gift over $50 in value. Stay tuned for details.